Just thought I'd start a thread for when the U12+ starts shipping. It's still all up in the air right now on when it's gonna start. I've emailed HTC for a more specific date, but haven't heard back. With the Amazon preorder going from June 7th to the 21st, and the more mainstream accessory makers not shipping until the 25th (Skinomi full body) or even in July (Spigen), I'm guessing later June. As of today, June 2, my HTC financing still says pending. It's starting to look like an LG release honestly. Put some extra patience in that coffee. I hate when OEMs leave release dates up in the air. I'm not even bothering with anything that's not confirmed anymore. LOL. I'm just used to Apple releases, where even with the X I had to wait from announcement to release, I at least knew the dates. If it's the end of June that's fine. I'd rather have a specific date. Yeah I saw some of your pics over in the iPhone X pictures/videos thread as well. I browse around.lol But even though I've never bought an iPhone I've always admired and coveted how they announce their products with price and release dates on the same day of announcement with demo units available within a couple days after. That is just so great for their brand. I wish LG could do the same as well as HTC. It seems Samsung and Google are the only Android OEMs who can pull that off. So anyway, you've already got the X, why the interest in the U12+? Pixels haven't really done anything for me for some reason. I think it's because I don't care for Google's apps. I know I can switch them out, but if I have to use a 3rd party app for every fundamental app it's not worth it to me. I also kinda hate that glass window thing. It looks ok on the Panda version, but I don't like it on the others. I plan to keep my next phone for two plus years at least and that's why I'm currently living life simplistically with an LG Aristo and Lumia 1020 for photography up until the Google Pixel 3 is announced since it will most likely be the last major phone announced of the year. Then I can make a decision from what's available. This older guy I work with just upgraded from a Galaxy S3 he had for five years. He came to me excited last week cause he has the S9 now with Gear VR and he was raving about how cool it was. I couldn't help but laugh at his excitement cause I was telling him it was time to upgrade for a while. And now he's telling me about experiences I haven't even tried yet in the VR stuff. I was always curious about it but never tried it yet. Ok I can see that. Right now I have the S9 at the top of my list being the last phone with all the hardware features in a headphone jack, wireless charging, and microsd card support(LG does too). Not sure how long Samsung will continue to keep all of these in their flagships. Amazon has said June 21st, may be that's a conservative date. But I'm not expecting anything to move till June 15th or so. Even HTC in Twitter said sometime in June when people tried to get the exact date. It's crazy how they don't have actual release date. I like Apple, now Samsung and even OnePlus where they announce and thing is ready to ship within a week or two. Google is getting better with Pixel. I think the biggest thing is people can't try before they buy either at least as far as I know. I really wish their situation was better. This will probably be one of the most underrated phones of 2018. If anyone wants to snag one early, I'm selling the one I grabbed at the NYC launch event on swappa. it's crazy there is no set launch date. No wonder htc is in financial trouble. If anyone wants to snag one early, I'm selling the one I grabbed at the NYC launch event on swapped. Are the sides black or more of a dark blue. It's hard to tell in everything I've seen. same, I'd appreciate a fixed date even if it means last day of June! I attended the NYC event last week and spent some quality time with the blue U12+ and HTC's Global Director of PR. I thought the edges did look darker than the area around camera. Coming from a HTC10, I really thought this phone is a killer. Did not buy one last Wed, but will once I get home at months end. 1. 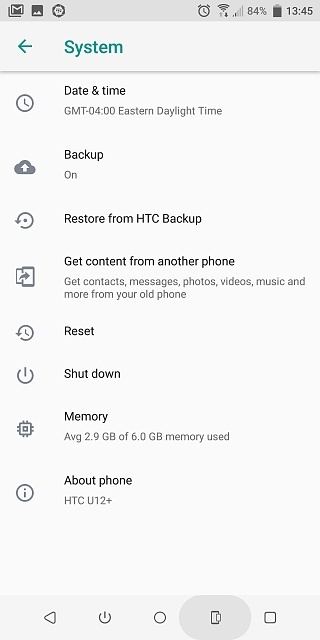 Has anybody looked at how much HTC is asking for the HTC U12+ ? Crikey !!! $799 for the 64GB version. That's a lot to be asking in my opinion. That's the same price as an unlocked Iphone 8 while the Samsung Galaxy S9 is going for $719. The clincher here now is Oneplus selling the Oneplus 6 for $529 for the base version 6GB RAM 64GB Storage. Can HTC justify such a huge price tag when there is a good alternative from a competitor offering near par values ? 2. I have gone through the HTC U12+ pre order pages on both the US, UK and Middle East sites and i noticed a slight difference in the SKU offered for sale. It seems the SKU sold in the Middle East (Dubai) will come with some free accessories e.g screen protector & noise cancelling headphones while it doesnt appear the same for the US and UK. Anybody have any insight into this ? The noise canceling headphones are in all markets. All markets I’ve seen also include a clear case. I’m not sure about other accessories. I know there’s no 3.5 adapter or screen protector in the US. 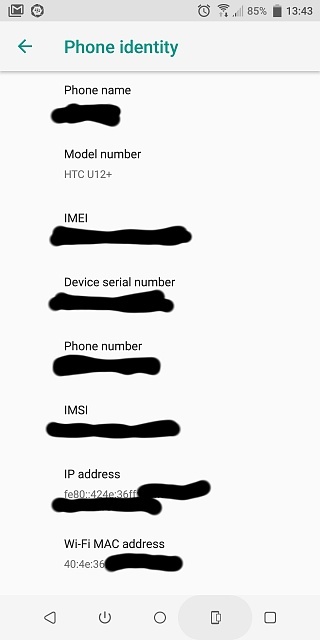 I just spoke with HTC support. They told me June 23rd they start shipping, and early July for Canada. Definitely black. And even the back glass is only really blue-ish toward the center where its clear. As it fades to the edges it gets really dark in color. I could have it out to you today. PS: the thin sides around are black but the edges of back panel are still blue, just not translucent. Take it out on a sunny day and it looks gorgeous, with its all-blue back. How are you liking the phone? Does it feel big in the hand? What's the performance and battery life been?